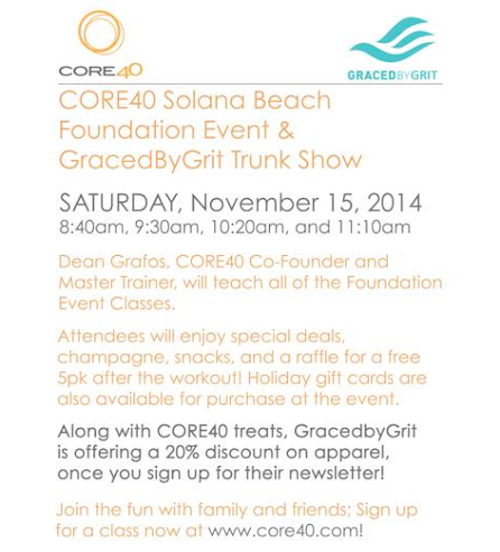 GRACEDbyGRIT has teamed up with CORE40 to bring you another trunk show, and SD Style Bloggers are invited! GRACEDbyGRIT is the women's fitness apparel that you've been missing. Designed with the perfect combination of form, function and fashion in mind, GRACEDbyGRIT is the only multi-functional gear that can take you from a CORE40 pilate's workout to a swim at Solana Beach. Attendees will enjoy a raffle, special deals, champagne and more! Time: 8:15 a.m. - 12:00 p.m.
See you there, gritty gals! Please direct all RSVPs to Monica Chang at monica@besocialpr.com.